1958 – to be recreated in 2018! At the beginning of the SSS4 Gala last weekend, we spoke to Quentin McGuinness, chairman of the 6880 Betton Grange project based at the Llangollen Railway and his interview is below. We also watched work in progress, spoke to other members of the team and we will publish another video showing work being carried out on the locomotive shortly. The Project really inspired us (as does the 1014 County of Glamorgan Project at Didcot) and while it may be regrettable that 7927, one of the very last series of Modified Halls, has made the ultimate sacrifice to mAke it possible, we believe that it is a compromise well worth making. 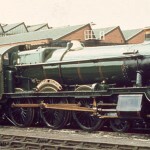 If you want to see a 79xx at work, well, you can help to put Foremarke Hall back together by volunteering at Toddington! We want to see the new Grange steam as soon possible so we have now signed up as members, making a monthly contribution for as long as it takes. Please consider doing the same or make a contribution to the boiler appeal.